Tory Housing Minister Grant Shapps lied to voters on BBC Question Time last week when he claimed that house building was increasing. It is on course to be the lowest since 1946. 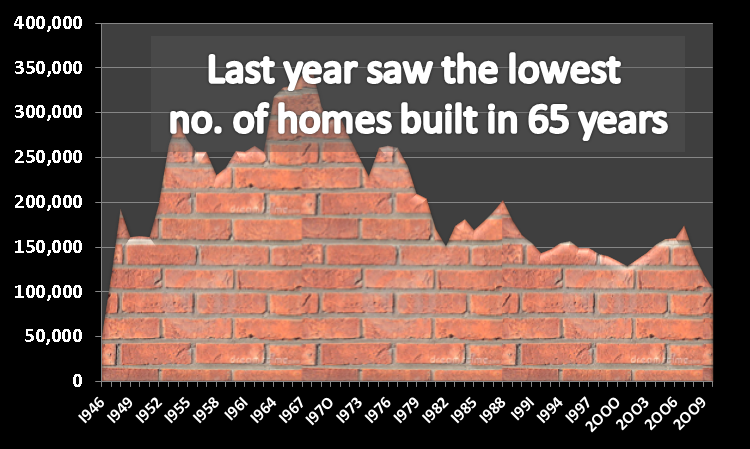 House building in 2010 was the lowest for 65 years. The Tories worm their way out of culpability for this by claiming that 2010 was the tail end of the Brown administration and they would do things differently. So, have they? The graph above shows the number of homes commenced in the first 9 months of this year versus the number of homes commenced in the first 9 months of 2010. Guess what? It is getting worse. The number of homes commenced in 2011 is 8% less than the like for like period in 2010. Given that 2010 was the lowest number built since 1946, then we can say that this year is on course to beat that. Grant Shapps second year as Housing Minister will see him preside over the 2 worse house building figures for 65 years. In the midst of all of that, Grant wants to solve the problem by asking you to swap your home with a neighbour, or consider living on boats parked in British waterways. Today, he is to announce an extension of the Right to Buy Scheme that was pursued by Margaret Thatcher. The Tories are set to preside over the worse housing crisis the UK has seen in 65 years. This is a tragedy on a scale with the housing crisis at the end of the Second World War. Eoin is an occasional contributor. He is a founder of the Labour-Left think-tank and writes regularly at the Green Benches blog. Housing association does not equal public sector. I see that “sclerosis” and “sclerotic” are now in vogue on the right. If only they had any room to talk. @2 Especially using it wrongly, such as in this case. “So, have they? The graph above shows the number of homes commenced in the first 9 months of this year versus the number of homes commenced in the first 9 months of 2010. Guess what? Well, no, we cannot quite make that leap. You see, you’re comparing two different things. Housing starts and housing completions. I agree that your figures for housing starts (for England only, you really should define your statistics better) are correct. 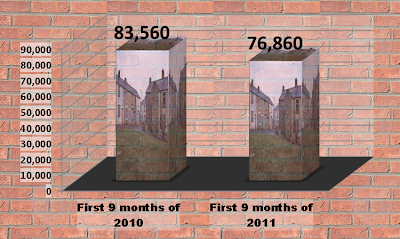 However, housing completions for the first 9 months of 2011 are, at 79,840, higher than housing completions in the first 9 months of 2010, at 77,150. It’s because houses take some time to build you see: we cannot assume that lower starts in 2010 will lead to lower completions in 2011. Eoin, you’ve really got to buck up your statistics. Yes Sunny, housing figures can be confusing. Which is why I went and looked up the figures here. And I know those are the same figures Eoin used because I got the same, 83,560, for the first 9 months of 2010. You’ll note that the FT is quoting 2008, 09 and 10 figures, while Eoin and I are quoting first 9 months of 2010 and first 9 months of 2011 numbers. Housing figures can be confusing but calendars are supposed to be less so. Just as arterial sclerosis involves an accretion of fatty deposits impeding the free flow of blood, so the institutional sclerosis common in public and third sector organizations involves an accretion of bureaucratic practices that impedes the free flow of initiative and investment. The problem is that in private industry, the corollary to that statement is that large investments only ever seem to flow up, with executive bonuses and shareholder dividends (most of which end up invested abroad and/or in offshore tax havens) dwarfing investment in business expansion and improving the lot of employees. This is part of the reason (besides 18 years of deliberate underinvestment) that Brown’s only option to meet promises on unemployment was to expand the public sector – because the private sector’s employment numbers were actually contracting when taking population growth into accont. The corollary to your assertion regarding the public sector is that with the private sector investment only ever seems to travel upwards, with executive bonuses and shareholder dividends (most of which are invested abroad or stashed in offshore tax havens) dwarfing the money spent on expanding the business locally and improving the lot of employees. In fact, other than 18 years of deliberate underinvestment, you’ve got the other reason Brown was forced to expand the public sector right there – because from the ’80s onwards reliable private sector employment effectively *contracted* when taking population growth into account, and the only way to bring down unemployment and keep the manifesto promise was to expand the public sector. Ignore repeated message – form post went wonky. Can anyone tidy it up? “However, housing completions for the first 9 months of 2011 are, at 79,840, higher than housing completions in the first 9 months of 2010, at 77,150. Are you really suggesting that houses started under the previous administration and completed over two years or more are a credit to the *current* administration? You’ve really taken ‘grasping at straws’ to new levels. I’m not trying to assign credit to anyone. Although if you worked at it hard enough I’m sure you could…builders go bust half way through, glorious Tory govt improves conditions so that newly constituted firm finishes them off. But you might have noticed that I’m a pedant about various forms of statistical reasoning. And here Eoin is simply wrong in his inferences from the statistics he’s looking up. It’s not quite as bad as Sunny posting a graph showing that median wages rise under Tory admins and then claiming that right wing policies only crush the workers wages but still wrong. Really? How come UK pension funds have assets worth $2.3 trillion then? dwarfing investment in business expansion and improving the lot of employees. Really? In Q2 2011, business investment in the UK stood at £30.6 billion. Even in times like these. As for improving the lot of employees, I refer you to Sunny’s chart alluded to by Tim Worstall above, that shows the median wage rising nicely under Tory governments, but less well under New Labour. Of course the median wage is going to track higher if the number of working-class unemployed is allowed to skyrocket (as it did under the Tory administrations), and the economy’s focus is switched to the financial sector (where median income is considerably higher, but the number of jobs considerably less). Lies, damned lies and statistics yet again. Or perhaps it might have something to do with a £4bn cut in social housing funding? Oh, is that what you call slashing public sectors budgets massively, and then not expecting cuts. Nope, gotta blame anything except the cause. The scandal is empty houses and unused, landbanked brownfield sites, all when perfectly usuable housing albeit terraced is being demolished in the north.